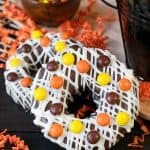 Cookies and candies add a fun flair to these easy no bake Chocolate Dipped Halloween Apple Rings. 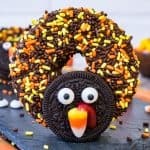 Fun and delicious treat for any fall party! *This post was sponsored by Crunch Pak apples. 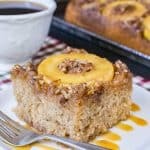 I am partnering with them as a blog ambassador creating delicious apple recipes. All opinions are 100% my own. It’s finally that time of year! The time of year when googly eye treats reign supreme. Ok, ok, so I usually find a way to add googly eyes to every holiday. But I feel like Halloween is the best time for adding fun eyeballs to everything. I don’t know what it is about those little candy eyes, but they just make me giggle every single time I see them added to treats. Seriously. They crack me up! Can you look at these Frankenstein marshmallows or these no bake Rice Krispies owl cookies and NOT smile? I didn’t think so! 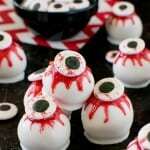 Now these peanut butter zombie eyeballs are another story because I’m not sure that bloody eyeballs make anyone laugh. But they sure do make a fun, creepy treat for parties. We are on day three of APPLE WEEK, people. Can you believe that the apple fun is almost over? 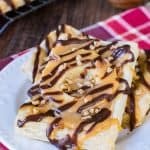 So far this week I have made caramel apple cheesecake tarts and an apple pecan upside down cake, but today I wanted to share a fun way to use the Crunch Pak apple rings without turning on your oven. I went ultra simple for my no bake “recipe”. I even hesitate to call it a recipe because it is so easy. Maybe we should say apple craft. That actually sounds better and a little more accurate. Sandwich your Crunch Pak Apple Rings between paper towels about 10 minutes before you start dipping them. This helps to pull some of the moisture off the surface of the rings. Moisture and chocolate do not get along very well, so this is important. Prep all your different pieces for each creature before you melt the chocolate. 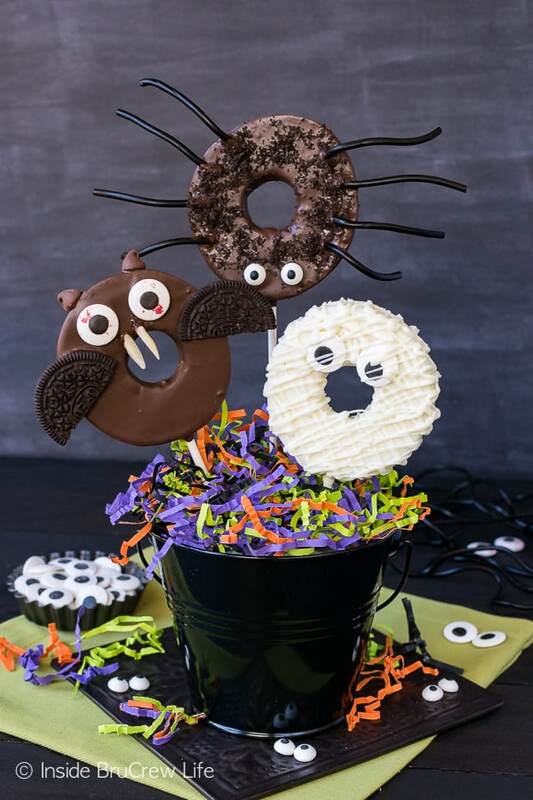 Set out bowls for each thing like the cookie bat wings, crushed cookie fur, licorice spider legs, almond sliver fangs, chocolate chip ears, and candy eyeballs. Decide which creature you want to start with and do all 4 of those first. You can use lollipop or cookie sticks, but I did find that those didn’t hold up after sitting for a day. They will be perfectly fine if you are making these the day of a party. Popsicle sticks might be a better solution if you need to make these ahead of time. Use a sharp knife to cut a slit in the bottom of the apple, then insert the sticks. Make sure to have a paper towel handy because more juice will come out as you do this. Melt your chocolates according to the package directions, then use a spoon to pour chocolate over each side of the apple rings. Tap the sticks very gently on the side of your bowl to remove some excess chocolate. Place on a parchment lined tray to dry. For the bats, add the eyes and wings while the chocolate is still wet. Wait to add the chocolate chips and almond slivers until the chocolate has set up. Dip the tips of the almonds and the bottom of the chocolate chips in the chocolate and press to attach them to your bats. For the mummies, place the dipped apple rings on the tray and press the eyeballs in while wet. After you have dipped all 4 rings, spoon the remaining chocolate into a baggie and cut a small tip off. Drizzle randomly over the tops of the rings to create mummy strips. 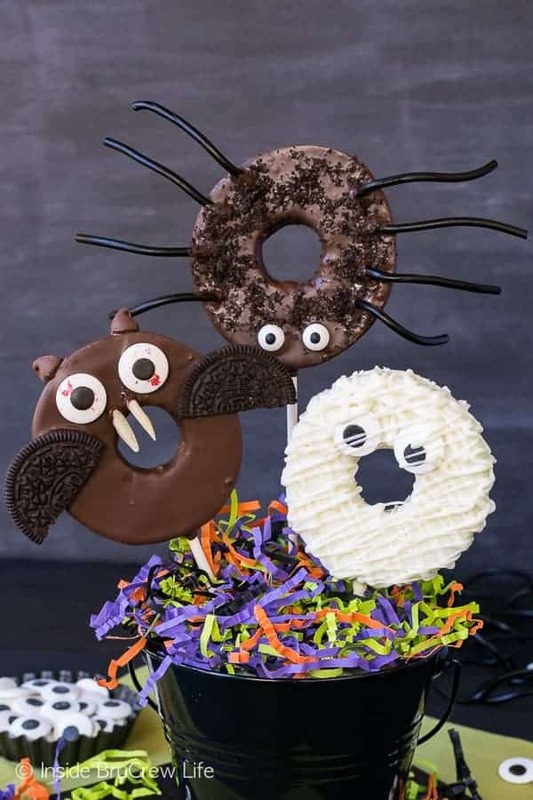 To serve these fun chocolate dipped Halloween apple rings, press the sticks into pot filled with styrofoam or wrap them up in plastic baggies and a bright colored string. Make sure you head over to my friend Aimee from Shugary Sweets to get the recipe for her Caramel Apple Ring Pops. I love that she incorporated her favorite girl scout cookie into her no bake apple pops. So creative!!! Sandwich the apple rings between paper towels and pat dry. Crush 1 cookie into fine crumbs. Remove the filling from the other two cookies and cut each piece in half for wings. 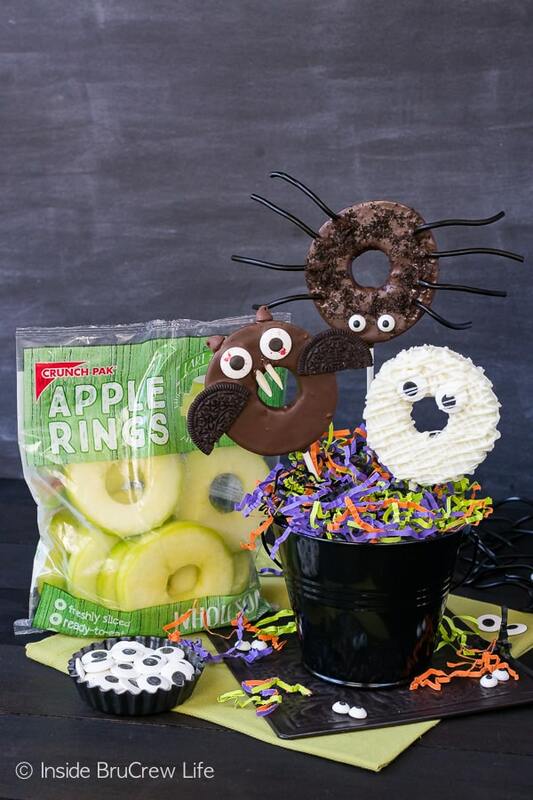 Use a knife to cut a small slit in the bottom of the apple rings and insert a lollipop or popsicle stick. Use the paper towels to dry the juice off. Melt the dark chocolate according to the package directions. 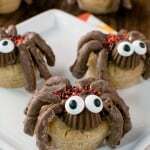 For the spiders, add the eyes and crushed cookies while the chocolate is still wet. Dip the ends of the licorice strings in chocolate and attach to the top of the apple rings. This works better if you wait for the chocolate on the apple rings to set up slightly. You also may need to hold the leg for a few seconds before it is able to stand by itself. Add a little bit of crushed cookie over the chocolate dipped end to make it blend in better. *I did find that the licorice legs stayed on the spiders fine the day I made them, but the next day they fell off easily. 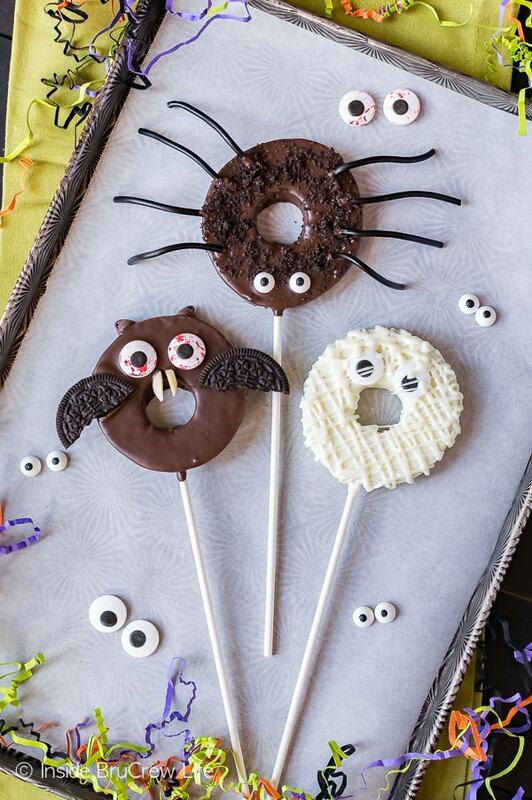 You make the cutest halloween treats! LOVE that you used crunch pak apple rings for these 🙂 YUM! These are just the cutest, Jocelyn!! Thank you 🙂 They were fun to make!